As I approached the end of my time with The Banner Saga 3, it elicited a similar feeling that I had when I was reading through Tolkien’s magnum opus, Lord of the Rings: Return of the King. Feeling that same sensation of a sprawling epic coming to an end and that my departure from a world and its inhabitants that I shared a connection with was imminent – it was difficult not to feel emotionally affected. Still, all good things must come to an end and The Banner Saga 3 most certainly is very good indeed. 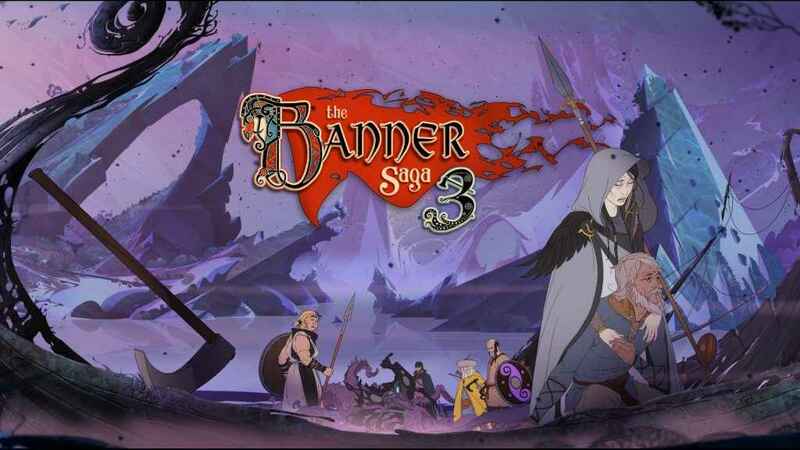 The third and final entry in a trilogy that has been in development for nearly a decade, The Banner Saga 3 proffers a wholly entertaining finale to one of the best strategy RPG hybrids available on PS4 and is a must for fans of tactical RPG efforts. One of the many things that The Banner Saga has done extremely well since the beginning is in how it created a compelling cast of characters and then wrapped a typically epic and engaging narrative round them. Whether that was a battle to save a town, or achieve flight from a group of pursuing enemies that lasted for a seeming age, the breadth and scope of The Banner Saga’s heroic tale increased exponentially from game to game, and in The Banner Saga 3 the stakes have never been higher because, well, the world is quite literally about to end and all must come together in order to fight back what appears to be an impossible situation. The Banner Saga 3 refines the series turn-based battle system. More than the macro narrative however, another key reason why The Banner Saga succeeds in enrapturing players so entirely is because the relationships between its burgeoning cast of characters is also equally captivating; a fact that serves to ram home the emotional grief all too keenly when the brown stuff hits the fan, because, boy, does it ever hit the fan. Indeed from the beginning, though The Banner Saga has arguably been influenced by the likes of Tolkien and Norse mythology, the murderous pen of Game of Thrones author George R R Martin can be felt throughout the trilogy. It’s perhaps Martin’s influence that is most keenly felt in this final instalment because The Banner Saga 3 is deeply steeped in tragedy, sacrifice and personal loss – with the bodycount getting higher and higher the closer you get to the end of the story. If there is one complaint about the narrative itself it is that the ending feels a touch rushed for a story of this size, and events just sort of come to an abrupt end without a thorough pay off for all the stakeholder characters involved. Don’t get me wrong, I’m not suggesting that the developers should have gone for the patience-trying seven or so different endings that Peter Jackson’s The Return of the King had, but something more satisfying than the current ending and additional post-credit scene would seem to be appropriate given the mammoth scope of The Banner Saga’s sprawling story. Reflecting the apocryphal premise of the series at this point is the manner in which The Banner Saga 3 plays out – which is to say that The Banner Saga 3 continues where The Banner Saga 2 left off; the caravan of heroes has split into two and the chapters often hopscotch from one group to another. 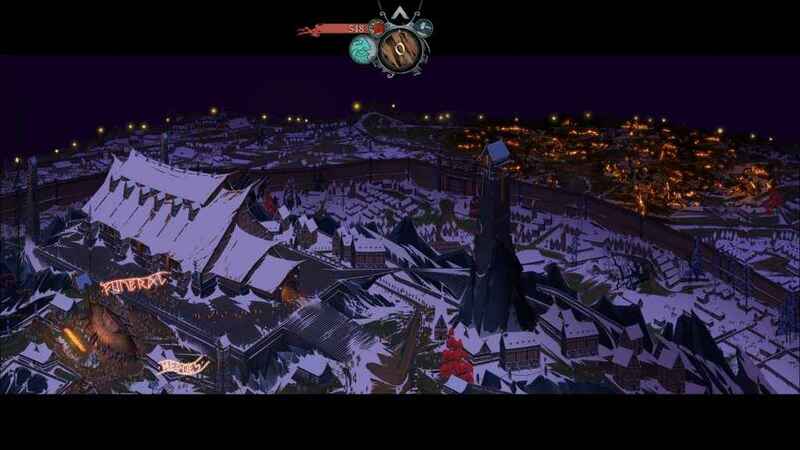 Here however, the two camps have very different objectives; Rook and his followers which form the bulk of the survivors from The Banner Saga 2 must make it to the safety of the capital city of Arberrang, whereas Folka and her Raven mercenaries, together with the mysterious spell-casters Juno and Eyvind, have to venture into undiscovered territory in order to decipher the reasons why the world is literally breaking apart. The stakes simply don’t get much bigger than this. Continuing on from The Banner Saga 2, the third and final entry in the trilogy has players split between two different groups of characters. 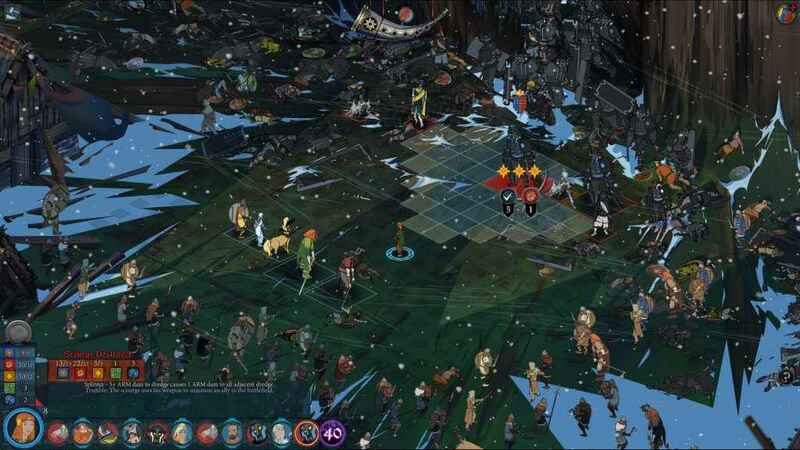 As was the case with the previous instalments in the series, The Banner Saga 3 continues to embrace a hybrid of RPG and tactical gameplay, with the player being confronted with numerous situations that each have a number of different ways to be solved, in addition to having to manage the supplies, morale and training of their group to ensure that everyone is in tip-top shape. Once the battles kick off, The Banner Saga 3 keeps to the turn-based beats of preceding episodes, forcing players to think frugally as they position their combatants around the field and utilise their abilities for maximum advantage until all foes have been vanquished. New to this third entry in the series is that players may now control the all-powerful Juno, an exceptionally talented Valka and spell-caster who can confuse and disorient the enemy and can resurrect herself by roaming the battlefield and collecting dark energy to return herself to life. 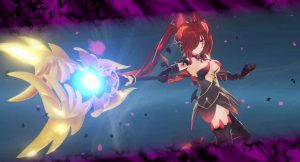 The problem with her is that outside of being forced to use her in some story-based battles, she isn’t a character that you’ll want to play a lot simply because she’s rather frail (the AI always seems to pick on her, regardless of difficulty setting), and doesn’t boast the raw damage output of many of the other playable characters in the game. Another new addition to the combat system that The Banner Saga 3 brings to the table is a new wave based encounter where you’ll fight off one group of foes and then be asked if you wish to continue fighting or flee the battlefield. 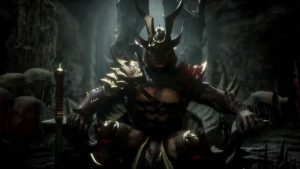 Now, the benefit of staying is that the longer you last, the more renown you can earn to upgrade your characters or buy supplies and equipment with – while lasting until the very end earns you a special item that you can’t get anywhere else. Continuing the precedent set in previous games, the story in The Banner Saga 3 is both sweeping in spectacle and emotion. Don’t worry though, if you find yourself being pummelled and just scraping through each wave, you can always reinforce your combatants with any of the folks who may be sat on the bench. Likewise there’s a real benefit to quitting a wave battle early too since if you’re playing on either the medium or hard difficulty setting, the injuries that your group might accrue could conceivable outweigh the benefits a single item might bring. As such, these new wrinkles to its formula essentially provide an opportunity for additional strategy and The Banner Saga 3 is arguably better as a result for having them. 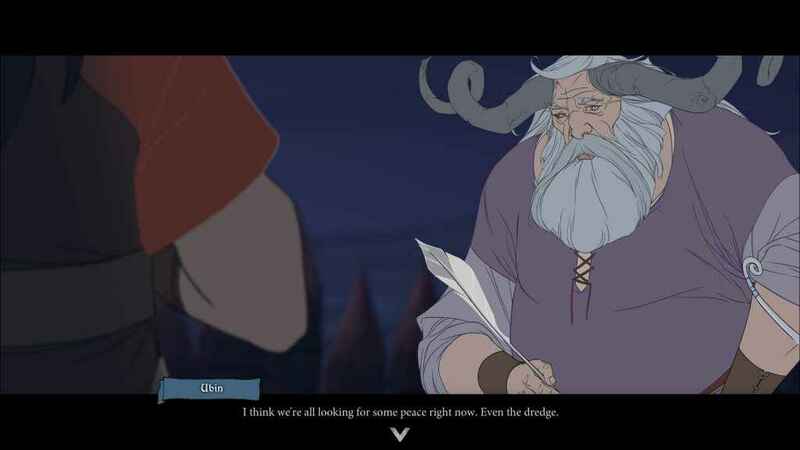 Speaking of new gameplay elements, there is something that occurs in the final third of The Banner Saga 3 which inextricably ties together the fortunes of the two separate camps, as well as taking stock of everything you have done up until that point. Again, this is something I don’t want to spoil and so I can only speak about in the vaguest terms, but all the same it is something which is handled extremely well as it actually makes you feel invested in the fate the two camps share. Any review of The Banner Saga 3 would be remiss not to remark on the heady level of audiovisual presentation that the game oozes from every pour. From the splendid, ear-caressing Austin Wintory composed soundtrack that perfectly nails the Nordic mysticism that the developers strive for, to the sheer wealth of animated scenes and gorgeously detailed art, The Banner Saga 3 is one of the most resplendent titles money can buy and continues on the series fine tradition in this regard. If you’ve gotten this far with The Banner Saga series, then The Banner Saga 3 is the easiest recommendation I’ll ever make to you as it’s likely that you’ll be wanting to dive in feet first anyhow just to see how the whole thing ends. Gorgeous to look at and stuffed with great strategy, battles, characters and storylines, The Banner Saga 3 finishes the trilogy in fine form. 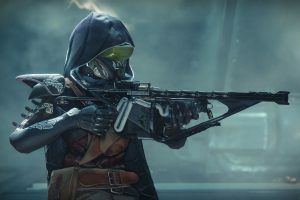 Just don’t expect any radical departures in terms of gameplay – this is one series that was hardwired to finish this way all the way back from the time it began in 2014, and in doing so has provided the PS4 with one of the best strategy RPG trilogies in years. Review code supplied by the publisher. The Banner Saga 3 is available to buy right now on PS4, Xbox One, PC and Nintendo Switch. A fittingly bombastic end to one of the best tactical RPG series on PS4, The Banner Saga 3 closes the book on a trilogy that fans of strategy and epic, sprawling stories should embrace immediately. The story certainly ended on a sad tone. I cant believe The final level was that hard. at least for me. Wonderful review as always. I would also recommend this one if you want more.